Sup Dawg’s? I got some Sonic news for you. A Sonic the Hedgehog costume…. For dogs! 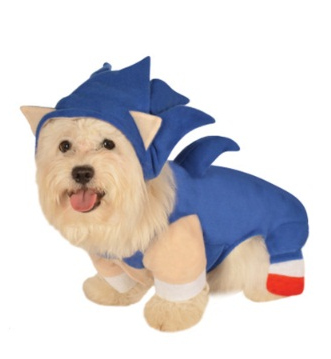 A Sonic the Hedgehog costume… FOR DOGS! Erm… Can I fit it on a cat? This costume has popped up for order on halloweencostumes.com, current asking price is $20 + Postage. I can’t imagine it being official but. If you fancy turning Fido into the worlds fasted hedgehog. Well hot dog, nows your chance! Pay no attention to the fact that they have just photoshopped the costume onto the dog and not managed to get one to sit still enough to put him in one. It’s a Sonic costume! For dogs! It comes in small, medium, large and extra large, though you might want to get on the dog n’ bone to get more accurate measurements. Anyone here going to order one? Regardless as to if you own a dog? You’d be barking mad not to take avantage of this find. Edit: According to the website, this is indeed an official product. Lets play how many sight gags can you spot… lawl. It’s back, with a vengeance… and this time, it wants your blood! Or something. 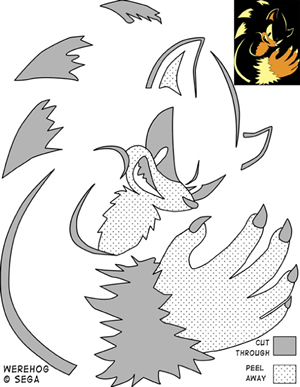 Yes, the awesome Hallowe’en pumpkin stencils we offered last year are back, and now they’re permanently archived in a new section in the Media section over on the sidebar. Click on ‘Other Downloads’ and you’ll be taken to a page where our miscellaneous content will go, as and when we get it. Rally the Cheetah lovingly made these so you can create your own Sonic pumpkins at home! And there’s still a day left to go to prepare, so what perfect timing! New additions have arrived if you don’t fancy doing the same carvings as last year though, with Silver and an incredible Sonic the Werehog stencil for those looking for a challenge. You’ll need a hell of a pumpkin for the Werehog one, but doesn’t it look badass? Most appropriate for the season, don’t you think? You can find a direct link to the Hallowe’en Pumpkin stencils here, if you don’t fancy going through that extra click, you lazy git, you. 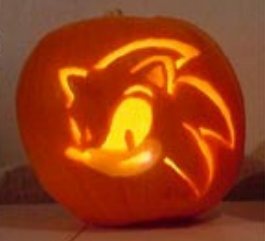 Be sure to write about your own Sonic-themed pumpkin/Hallowe’en stories in the comments box, and from me and everyone at TSS, have a ghoulish weekend! It’s generally understood that you only submit one entry into competitions. 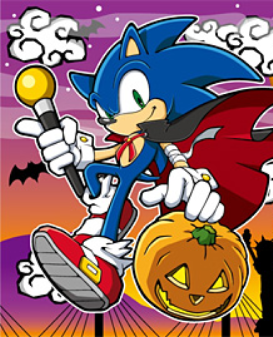 The case is no different with our currently ongoing Hallowe’en Competition for some Sonic Chronicles goodies. We can understand that one or two people may send two entries – be it accidentally (dupe-entries) or on purpose just to see if they can push their luck. But this is a bit excessive. ‘datkross412‘ decided that one of the best ways to get our attention is send in a whopping eighteen entries, featuring almost every Sonic character under the sun. The guy even did Sonic twice. I guess the plan was to see whether one of them was our favourite character or something. There was an entry for, in order: Sonic, Chip, Werehog, Tails, Rouge, Blaze, Shadow, Knuckles, Silver, Super Sonic, Eggman, Vector, Espio, Big, Amy, Metal Sonic, Elise, and Sonic again. So yeah. Obviously, that’s taking the piss. We’re not going to pick the best one for his entry, much less look at them, so ‘datkross412’ here’s your challenge – pick one. Pick the entry you want to enter for this contest. If you don’t, we’ll bin them all and disqualify you. Usual contest email address, just give us the name of the character you want to keep. And that ends today’s lesson in “Don’t give Svend a headache”. Thanks for playing. Thanks to Sega Europe, we have a few Sonic Chronicles goodies to give away on The Sonic Stadium. Just in time for Hallowe’en too! See that photo up there? The Chronicles tin and stylus pack? There are five of those to give away. You could win a set of them, you could. There’s also a super-secret squirrel Grand Prize goody bag, which will be sent your way should you impress us the most. 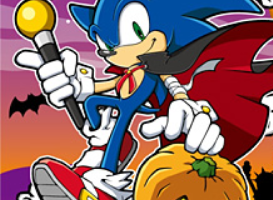 Pick any Sonic the Hedgehog character, and describe to us how they would Trick or Treat someone. It’s as simple as that. Imagine a Sonic character of your choice, knocking on a house door. What does that character do when that door opens to get as much candy as possible? Funny, scary, or downright weird entries are all acceptable, so do your worst (on all accounts)! Send your entires to dreadknux@gmail.com with your name, email address and what your chosen character does. Closing date for entries is the 7th November 2008. Good luck! To get you into the spirit of things, SEGA have made this awesome Hallowe’en trailer for Sonic Unleashed. But it’s not a trailer for the game. 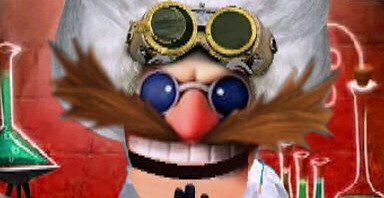 Nope, it’s a trailer for a special animated film that SEGA are producing, to tie in with the game. So it’s Sonic the Hedgehog’s “Thriller” then. It’s done in a classic horror movie style, and features Sonic and new character Chip heading into a haunted house, with the blue blur unable to contain his dark secret when the full moon comes out… Almost reminded me of the intro to Luigi’s Mansion until Were-Sonic started beating the snot out of some Looney Tunes-esque bull. Give it a watch, it’s ghoulishly good. Ahem. The full animated short will be available in November. Hey you. Excited about Halloween? Good. Got a pumpkin? Good. Want to make a Sonic pumpkin? You’re in luck my friend, as The Sonic Stadium has a set of pumpkin stensils that you can use to make your favourite character glow viciously in the twilight. These designs were submitted by Rally the Cheetah, who created all but the Amy pumpkin (which was created by ‘The Lioness’), but feel free to print any of these onto an A4 sheet of paper and go nuts. You’ve got a choice of Sonic, Tails, Knuckles, Amy, Shadow, Silver and Blaze. Click here for the stencils, along with a special tutorial made by Rally in case you’re unsure as to how to create your own Sonic Pumpkin.